Introduction Note: This post was written by the founders of Yutumi. [caption id="attachment_320" align="alignleft" width="300"] Yutumi bye-you bug products. [/caption] Sarah Plunkett and Ryan McDonner, owners of Yutumi (You-to-me) have launched a new bug spray that will change your idea of how you apply and think about traditional DEET Free repellents. Many bug sprays seen on the market utilize traditional essential oils such as citronella, lemongrass, geranium, etc. Not only do these essential oils smell like bug spray, they feel like bug spray too. These products tend to leave your skin oily and greasy. 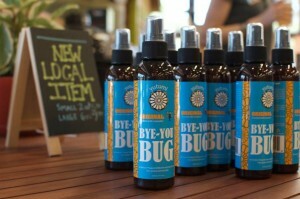 BYE-YOU BUG® was formulated to be the exact opposite of what you normally buy and use. It is non-greasy due to the main ingredients being pure vanilla extract (which is alcohol based) as well as soybean oil, citric acid (lemon juice), vegetable glycerin, and one essential oil that forms each unique scent. Therefore, you feel dry after spraying and rubbing it in to your skin. It smells aromatic because it uses vanilla as its base. As a result, our formula is the only formula on the market that allows us to customize scents based on an individuals needs and preferences. The formulation is comprised of food-based ingredients that are great for those who have sensitive skin and are worried about what they put on their body. It is safe to use on pets, kids, and adults. For those looking to enjoy the outdoors without smelling or feeling like they put on bug spray and eliminating toxins from their products and the environment, BYE-YOU BUG® is a great alternative. SPRAY MORE, SWAT LESS, SMELL GOOD!